4 Inch Neoprene Pads - Gilson Co.
4in (101.6mm) Neoprene Pads are available in 50, 60, or 70 durometer for compressive strength testing of 4x8in concrete cylinders, and meet requirements of ASTM C1231 and AASHTO T 22. These 0.5in (12.7mm) thick pads flow during compression to fill irregularities in cylinder ends and assure uniform load distribution. HM-181 4in Steel Retainer Set of two retainers is sold separately and required to contain the pads at each end of the concrete cylinder. Two pads are required for testing. Pads are reusable in up to 100 tests, and are sold individually or in a package of 12. HM-360 4in, 50 Durometer Pads are suitable for testing concrete strengths from 1,500-6,000psi (10-40mPa). 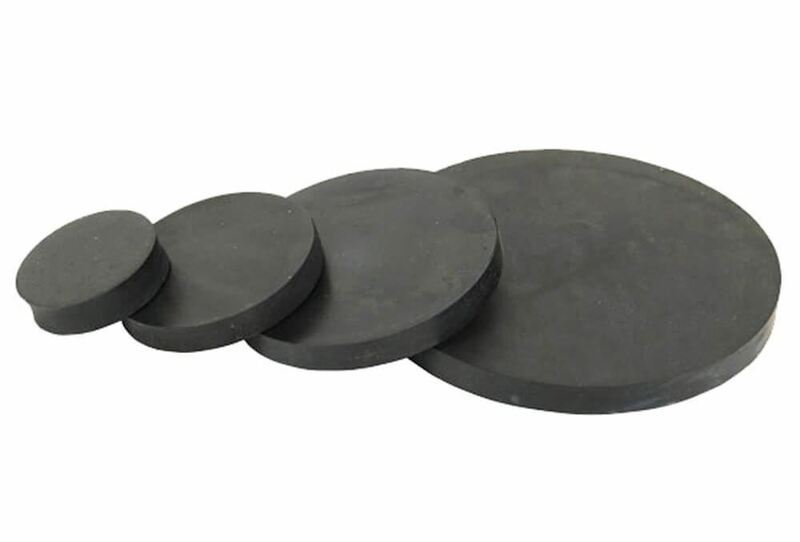 HM-361 4in, 60 Durometer Pads are suitable for testing concrete strengths from 2,500-7,000psi (17-50mPa). HM-362 4in, 70 Durometer Pads are suitable for testing concrete strengths from 4,000-7,000psi (28-50mPa). With further qualification testing by user, 70 durometer pads can be used to test concrete with strengths from 7,000-12,000psi (50-80mPa).